Several months prior to Śrīla Prabhupāda’s departure he signed a document to formalize the initiation process and granted some of his disciples to act on his behalf as representatives in the initiation process for his ISKCON society. 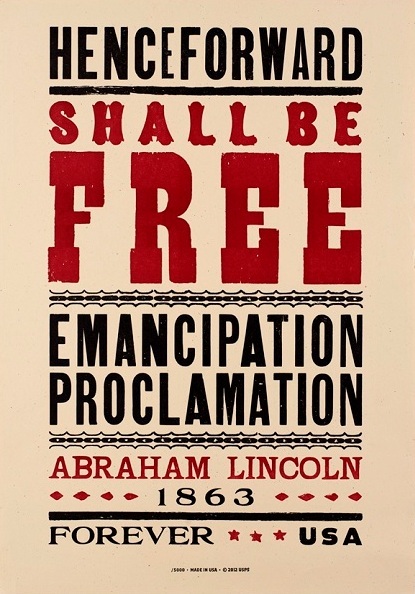 This document is known as the July 9th Document. These 11 disciples’ duty as delineated in the July 9th document, was “to act as ṛtvik representative of the acharya, for the purpose of performing initiations, both first initiation and second initiation” and were given no other ‘special’ duties or entitlements. Following is a breakdown of the specifics contained in the document for ease of reading. After considering the recommendation, these representatives may accept the devotee as an initiated disciple of Śrīla Prabhupāda by giving a spiritual name, or in the case of a second initiation, by chanting on the Gāyatrī thread just as Śrīla Prabhupāda had done. The name of a newly initiated disciple should be sent by the representative who has accepted him or her to Śrīla Prabhupāda, to be included in Divine Grace’s “Initiated Disciples” book. Basically the “representative’s” duty was to act in an official capacity to officially accept, name and record any candidates who were being recommended by the local Temple President for initiation while Śrīla Prabhupāda was not present. The Temple President did the rest. The 9th of July Document did not authorise the “representatives” to do anything else. How that would translate into practice would be if, say, the ṛtvik representative of Śrīla Prabhupāda was stationed in Vrdnavan while the candidate for initiation was a member of the Delhi Temple. The Delhi TP would send the recommendation to the representative in Vṛndāvan who would give the candidate their name or chant on their Brahmin thread. Once this was done the representative would record their name in the Śrīla Prabhupāda disciple book and the rest including the ceremony would be done by the Temple President. This left Śrīla Prabhupāda free to work on his writing and preaching activities. The July 9th Document did not authorise them as representatives of Śrīla Prabhupāda; to intervene in the process by removing the role of the Temple President in the initiation process established by Śrīla Prabhupāda and then take the place of the Brahman and preside at the fire yajña to personally initiating the bhakta. It also did not give them or anyone the right to act as a ṛtvik guru and personally initiate the candidate on behalf of Śrīla Prabhupāda. It merely granted a select number of devotees to act as Śrīla Prabhupāda’s representative in a more or less bureaucratic function in the initiation process. They were only ṛtvik ‘representatives’ of the Acharya [Śrīla Prabhupāda] for the purpose of initiation, and were never termed as, or considered ṛtvik gurus by Śrīla Prabhupāda. They merely officially represented Śrīla Prabhupāda as he was not able to be in attendance as it was a growing worldwide Society and Śrīla Prabhupāda could not be everywhere at the same time. Being a “representative” does not infer that one is a guru in any shape or form of the term. A representative is a person who represents someone else’s policy or purpose or stands in for a person. A representative represents someone for a specific purpose. If a representative is to represent Śrīla Prabhupāda for a TV interview it does not mean that the representative impersonates Śrīla Prabhupāda during or after the interview is over and conducts their affairs as if they were Śrīla Prabhupāda. They represented Śrīla Prabhupāda for a specific purpose, nothing more and nothing less. The idea that the ṛtvik representative of Śrīla Prabhupāda is a ṛtvik guru and actually initiates devotees on behalf of Śrīla Prabhupāda is a misconception. If there is no order rescinding this mandate by Śrīla Prabhupāda then one would have to believe that this system was established by Śrīla Prabhupāda to be enacted when he was not physically present to initiate the devotee, and is therefore still applicable. 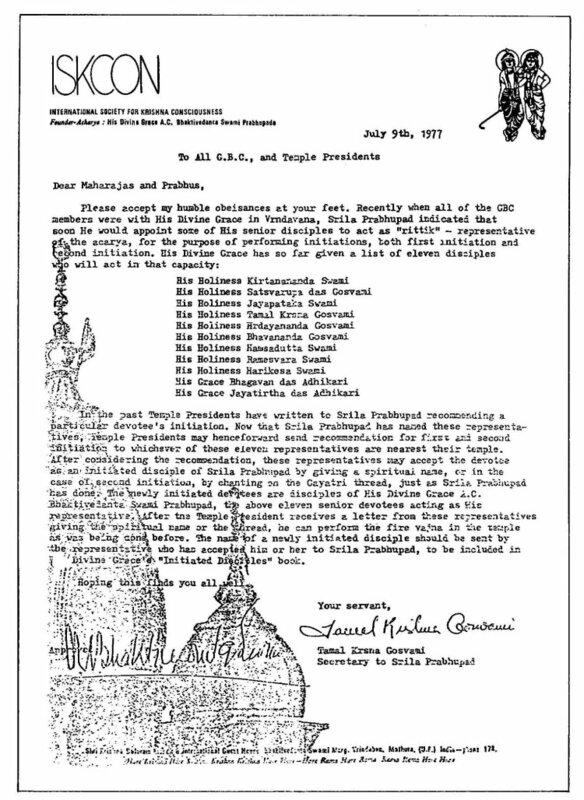 The ṛtvik representatives would continue as established by Śrīla Prabhupāda and they would have no actual part in the initiation process other than that stated by the July 9th Document. Senior men would be appointed by the GBC, as the need arose, to act in the capacity of a ṛtvik representative of Śrīla Prabhupāda, in the initiation process and the Temple Presidents would look after the rest. This system effectively removes the concern that everyone has, that the representative will impersonate Śrīla Prabhupāda, and start making their own disciples whether they are his ṛtvik disciples or his dīkṣā disciples. There will be no avenue for anyone to be anyone else’s disciple as they would be Śrīla Prabhupāda’s disciples; as per the July 9th Document. For no matter what – ṛtvik or voted in dīkṣā guru – no baddha jīva, who is not on the uttama platform, is able to withstand the allure of worship, fame, power and respect that such an elevated status brings. NO ONE! We have to accept that our duty, our sevā, our role in ISKCON under the auspices of Śrīla Prabhupāda is to act as preachers according to our actual adhikāra. To this day the GBC, as a body, use their positional power as managers of ISKCON to continue to promote and forcefully support the heretical philosophical deviation that the original 11 usurpers imposed upon Śrīla Prabhupāda’s ISKCON claiming that the role of a dīkṣā guru is open to anyone they deem fit and continues to appoint more and more unqualified, kannistha adhikāra devotees, into the role and function of a dīkṣā guru. Yet the July 9th Document clearly states what the process of initiation should be, when His Divine Grace is not physically present. The only contention would be that the neophyte devotee mistakenly believes that the soul dies when the body dies and that a Vaiṣṇava’s soul can also die and that they are no longer functional in the sense of providing diska or transcendental knowledge, divya jñāna, as they are dead. However, being the ‘devotee Bhāgavata’ embodied in his transcendental books which provide both the ‘book Bhāgavata’ and the ‘devotee Bhāgavata’; via Śrīla Prabhupāda’s purports, Śrīla Prabhupāda is always with us and instructing us and similarly Kṛṣṇa is there through the book Bhāgavata. Those with a poor fund of knowledge or who are envious in nature cannot understand these topics. “There are two types of Bhāgavatas, namely the book Bhāgavata and the devotee Bhāgavata. Both the Bhāgavatas are competent remedies, and both of them or either of them can be good enough to eliminate the obstacles. 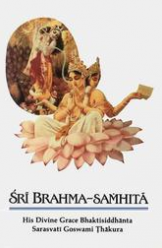 A devotee Bhāgavata is as good as the book Bhāgavata because the devotee Bhāgavata leads his life in terms of the book Bhāgavata and the book Bhāgavata is full of information about the Personality of Godhead and His pure devotees, who are also Bhāgavatas. Bhāgavata book and person are identical. So we can all stop dreaming of being a diska guru or a ṛtvik guru and allow the pure devotee, the śuddha bhakta, the mahātmā, the paṇḍita, the devotee bhāgavata, the seventh Goswami, the jagat guru and ISKCON’s dīkṣā guru, our parama guru His Divine Grace AC Bhaktivedanta Swami Śrīla Prabhupāda be who he is – the divine representative of the Supreme Personality of Godhead Śrī Kṛṣṇa. We on the other hand “represent” Śrīla Prabhupāda and as such humbly preach the glories of the holy name and do our duty as prescribed by His Divine Grace AC Bhaktivedanta Swami Prabhupāda. Trackback: HENCEFORWARD shall the “Rtvik Representative Of The Acharya” initiate on Srila Prabhupada’s behalf.